Notebook maker MSI beefs up its slim line of X-series notebooks Wednesday claiming new X460 and X460DX systems are the lightest models available on the market to pack Intel's Core i7 quad core processors. Weighing in at 4.3 pounds, with 14-inch displays, 1-inch thick, systems start at $800. You probably missed it, but last month MSI trumpeted the release of these notebooks leading up to Wednesday's release with slightly different specs than what we are seeing with actual shipping models. Still, both laptops are attractive for their 1-inch thinness, 4.3 pound weight, and an impressive estimated 8 hours of battery life. 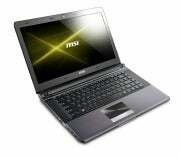 The X460 has the higher-end specs, with Intel’s Core i7 processor and 750GB (7200rpm) HDD. As a result, it has the higher MSRP of $1200. If you want a more affordable version of this slim laptop, the X460DX starts at $800. With a choice of either Core i5 or Core i3 processors, the X460DX also has an advantage for entertainment and gaming buffs: an Nvidia GeForce GT540M dedicated graphics card. Although MSI has dropped the X460’s “lightest laptop packing Intel Core i7 processor” claim to fame and you won’t find an unusual second internal drive in these laptops, the X460 and X460DX are more attractive options for the growing set of slim and sleek laptops. Both are available for order from Amazon and Newegg.